Carmelo Anthony and the New York Knicks: How did we get here? 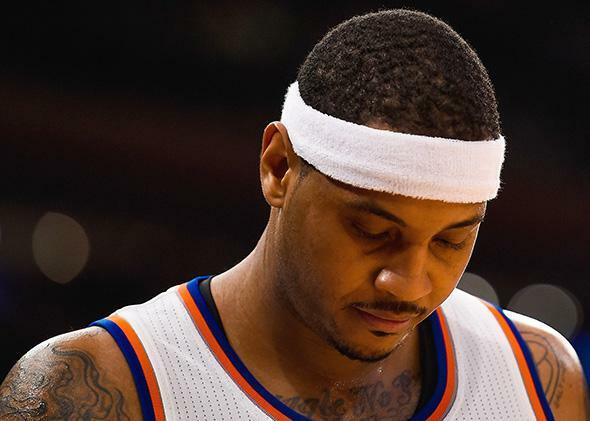 Did Carmelo Anthony ruin the Knicks, or did the Knicks ruin him? Carmelo Anthony of the New York Knicks, during a game against the Utah Jazz at Madison Square Garden on Nov. 14, 2014. On Tuesday the New York Times made the unusual announcement that basketball reporter Scott Cacciola would be removed from his beat covering the New York Knicks. Cacciola, the editors wrote, “deserves to see the game played at a higher level.” The Grey Lady has apparently given up on the Knicks, on the heels of the Knicks finally giving up on themselves. On Monday evening, with their record standing at 5-31, the team shipped off mercurial scorer J.R. Smith and cultishly adored defensive stopper Iman Shumpert for the proverbial “three players with nonguaranteed contracts,” all of whom were promptly waived. The Knicks will likely lose their 14th game in a row tonight against the Houston Rockets, a contest that will inexplicably be shown on national television. The effective euthanization of the 2014-15 New York Knicks is a merciful but bittersweet development. The NBA has a well-documented intentional badness problem, but what had made this Knicks season so special was that until recently the Knicks were actually trying to be good. The team’s gruesome win-loss record—the very worst in a league that still includes the Philadelphia 76ers—actually resulted from a good-faith effort to win. Theirs was an earnest, abject haplessness almost entirely bereft of cynicism, terrible basketball played purely for terrible basketball’s sake. Clogging up this failure-vortex like some extremely expensive clump of hair is Carmelo Anthony, the team’s star player who may or may not be on the brink of being shelved for the season. Anthony’s knee is hurt, the story goes, but the real reason for his potential impending vacation is that Carmelo Anthony is good, and good is no longer in his team’s plans. Shutting down a gimpy superstar isn’t a new idea: The Spurs put David Robinson on ice in 1996-97 on their way to a 20-62 record that would land them Tim Duncan, and the Boston Celtics shut down Paul Pierce in 2006-07, the year before they won their 17th NBA title. The difference in this particular situation is that six months ago Carmelo Anthony signed a 5-year, $124 million contract to remain the face of the Knicks for the foreseeable future. That’s an awful lot of money to pay someone to play basketball, and an absolutely insane amount of money to pay someone to do the opposite. Carmelo Anthony is often referred to as a “ball-stopper,” a pejorative for a player who disrupts movement in the passing game through his preoccupation with his own individual offense. The ball-stopper is needy, cumbersome, an obstacle to be overcome. It is, in a sense, a perfect metaphor for Anthony’s career, that of an immensely talented player who possesses a singular genius for trying to do too much, belaboring and awkwardly forcing his decisions, forever unable to stay out of his own way. Drafted third overall by the Nuggets in 2003 after leading Syracuse to an NCAA title as a freshman, Anthony’s early years in Denver were haunted by on- and off-court turbulence, most of which derived from his frustrating knack for being in the wrong place at the wrong time (his 2004 candid-camera appearance in a Baltimore “Stop Snitchin’” video, for instance). He also gained a reputation for being a postseason failure in the sports–talk-radio sense, even though, as Bill Simmons pointed out last summer, Melo’s mid-2000s Nuggets teammates weren’t exactly the Globetrotters. In 2011, after an overly drawn-out public tussle with Nuggets’ management, Anthony forced a trade to New York. The story at the time was that Melo and his wife wanted a bigger market for his celebrity, that Melo had looked at his draft classmates LeBron James, Chris Bosh, and Dwyane Wade chasing titles in Miami and wondered if he couldn’t lure a friend or two of his own to the Big Apple to do the same. It’s difficult to recall now but the immediate pre-Melo Knicks were actually a relatively young, exciting, and overachieving team, gamely executing Mike D’Antoni’s frantic offense through MVP-caliber play from Amar’e Stoudemire and supporting contributions from apparent up-and-comers like Danilo Galinari, Wilson Chandler, and Landry Fields. The Knicks—being the Knicks—gave up too much for Melo, meaning that Melo’s new team got worse on his arrival while his old team got better in his absence, another one of those things that wasn’t really Melo’s fault but could easily be made to appear Melo’s fault. In 2012 he was reimagined as the Grinch who Stole Linsanity, the most exciting run of Knicks basketball this century, bristling at an unheralded teammate winning the adulation that Melo had been prematurely promised. Melo is now on his third head coach as a Knick, his playoff fortunes have not improved, and he’s continued to accumulate a sort of low-grade ridiculousness: producing documentaries about himself, bragging about his tech startups, dressing like someone you’d meet in a Grand Theft Auto interlude. If Anthony’s team were winning all of this would be seen as charmingly eccentric, but Carmelo’s team is not winning, so instead it comes off as affected, distracted, tone-deaf. Why, a reasonable person might ask, did Carmelo Anthony re-sign with the Knicks? By his own admission he almost left for Chicago last summer, where he would have joined a Bulls team significantly better than any he’s ever played on. Leaving New York would have reportedly cost him almost $50 million, though—taking that amount of money to stay at your current job doesn’t make you greedy, it makes you sane, no matter how many millions you’ve already banked. From an image standpoint, leaving would have been viewed as more evidence that he’s a flighty and capricious quitter, an admission that he’s not The Guy he thought he was. Of course, staying leaves him to shoulder the absurd expectations that he’ll do what no Knick has done in more than 40 years, and no Knick has come even remotely close to doing in 15. And yes, it’s easy and not entirely incorrect to point out that none of this would be an issue if Melo hadn’t forced his way out of Denver in the first place, but if you think Carmelo Anthony would have ever had a legitimate chance to win a title by staying with the Nuggets, please do yourself a favor and go watch some Western Conference basketball. Rumors are already swirling that Anthony might be willing to waive his no-trade clause, even though trading a player making nine figures whom not all that many teams wanted in the first place might require mind tricks even the Zen Master himself can’t muster. But the remarkable thing is that Carmelo Anthony is now so easily maligned, so effortlessly framed as a problem in need of a solution, that he’s quietly become the one thing that hardly anyone has ever accused Carmelo Anthony of being: seriously underrated. Anthony is still an outrageously skilled offensive player who can dominate games like few others in the league. Just last year, in the midst of an abysmal Knicks season that next to the current one looks like a Michael Rapaport film, Anthony torched the Charlotte Bobcats for 62 points, 13 rebounds and zero turnovers before leaving the game with nearly eight minutes remaining. He might still pass Larry Bird on the NBA’s career scoring list this season, before his 31st birthday. Anthony may be a ball-stopper, but few in the league stop the ball so sublimely. Any team that’s turned Carmelo Anthony into a problem has much, much larger problems than Carmelo Anthony. Which brings us back to that team, or what’s left of it. Carmelo Anthony has made mistakes in his career, but the biggest has been believing what the Knicks organization far too long believed about itself: that basketball that happens in Manhattan is cosmically more important, that a zip code can magically exceed a long history of managerial dysfunction on nearly every conceivable level. As the last week has shown, the Knicks may have finally given up this particularly incompetent brand of exceptionalism, and just six months removed from free agency Anthony’s future is again uncertain. The Knicks and Carmelo Anthony have each spent the last four years trying to convince the world that they’re perfect for each other. The problem was always that they were right.